Parsiana, Cover Story, 21-Oct-2016, Pages 22, 23, and 24. The dramatic entrance gates sporting an orange and black stylized depiction of the Striped Tiger butterfly have welcomed over 2,000 visitors to the Native Biodiversity Garden in Teenvira near Alibaug since it was thrown open to the public on January 25, 2016 by Patsy Pallonji Mistry, wife of the chairman emeritus of the Shapoorji Pallonji (SP) group and Meenakshi Patil, a respected former member of the legislative assembly from the locality. 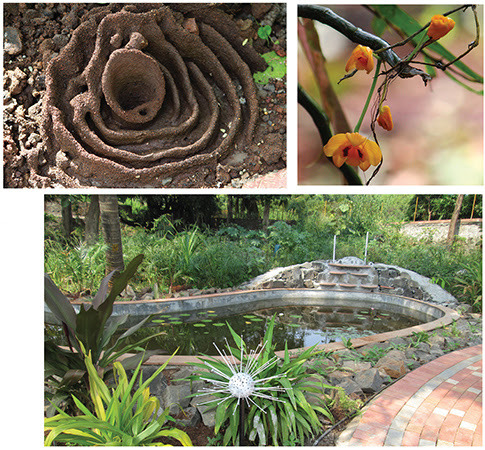 A Corporate Social Responsibility (CSR) project of the SP group, in partnership with the Centre for Environmental Research and Education (CERE) and the Raigad District Zilla Parishad which gave permission to develop the plot, the Garden is “the first of its kind in India” and aims “to serve as a learning resource for natural and cultural heritage,” states Dr Rashneh Pardiwala, founder and director of CERE, in a write-up sent to Parsiana. Shapoor Mistry, chairman and managing director of the SP group “is passionate about the environment and this project is close to his heart,” shares Zarine Commissariat, head of CSR at the group who visits the site at least every fortnight. “Both the family and the group place great emphasis on environmental sustainability and have taken numerous innovative strides in this direction. The Native Biodiversity Garden is one more step towards their commitment to preserve the environment and educate the public, especially children, on the importance of biodiversity,” Commissariat elaborates. It is difficult to imagine that the 1.2 acre plot, now teeming with native plants which have in turn attracted numerous insects, birds and animals, was not so long back a barren tract. Over 50,000 of these native plants belonging to 525 plus species have helped regenerate habitats for the entire ecosystem of the area. 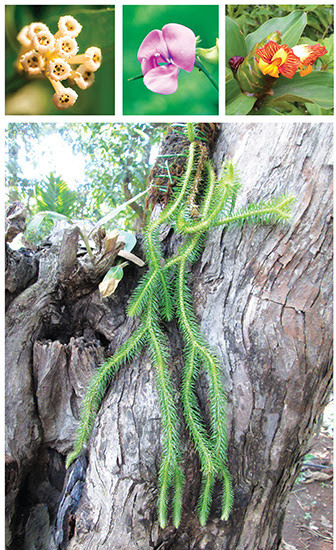 These are plants that have evolved over millennia in a specific region with special features that help them adapt to a unique environment, CERE notes in the write-up. Rapid urbanization and the concomitant pollution have resulted in extensive loss of natural ecosystems and wildlife which the garden aims at regenerating in this micro sphere. Described as “a template for future gardens to shift from manicured ornamental landscapes to habitats where native flora and fauna can flourish,” the Biodiversity Garden, which was designed for the SP Group by CERE using the expertise of horticulturists, botanists, landscape designers and artists, has already become home to many butterflies such as the Blue Mormon (which was declared the state butterfly for Maharashtra last year), Crimson Rose, Common Tiger and hundreds of common yellow grass butterflies. Other species such as harvester ants, praying mantis, signature spiders, chameleons, toads, wild hare and the rare colorful Asian Wasp Moths have also proliferated in the Garden. As education is an integral component of the concept, many topics from school textbooks have been incorporated in the design of the Garden. Until September 2016, students from 19 schools had visited the premises, Pardiwala writes, in response to Parsiana’s queries. “The Garden is a rich learning experience for students of all schools, especially relevant for standards five to nine. It has had visits by private schools from Alibaug, government schools, Zilla Parishad schools, teacher associations, college students, professors, botanists and the general public. Over 1,700 school children have visited till date as part of their study tours and the garden also has walk-ins from the general public who are interested in nature and biodiversity. Visitors are guided by a trained garden supervisor who is a qualified horticulturist. 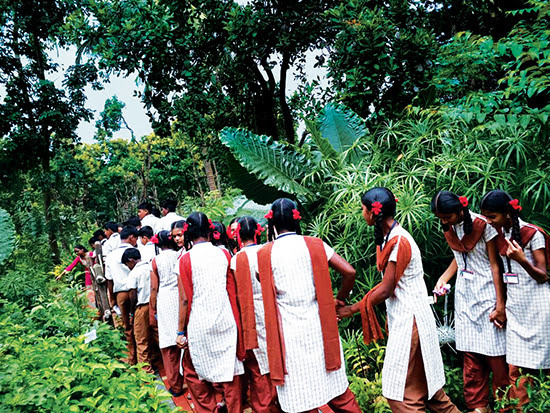 Pre-booked school tours are undertaken by a professional botanist,” she reveals. The Garden has “17 different thematic sections, namely sensory, medicinal, butterfly, wetland or pond ecosystem, grasses, ficus, orchids, ferns, bamboo, palms, spices, kitchen, vertical, adaptation, celebration and a sacred grove,” mentions its website. Also included is a special section on the Western Ghat species since Raigad district falls within this biodiversity hotspot where many species are on the verge of extinction. In the thematic sections children familiarize themselves with the distinctive characteristics of each group of plants, the write-up notes. When different varieties of bamboos are planted together, it is easy for visitors to notice similarities and differences. At each thematic section a plaque provides detailed information about the particular species; for individual species there are labels for easy identification. The lid of the water tank on the premises is embellished with wooden cutouts of leaves of different types and shapes. The lights in the garden also serve as educational tools, as they replicate the shapes of different types of seeds and mechanisms of seed dispersal. Gates have been used to depict native species of butterflies and moths, while flowers printed on large tiles along the outer walls evoke visitor interest. The section on “celebration” shows how different communities use plant products like henna to color hair and decorate hands and feet, dhoop scent and sandalwood. Seven sensory stations allow visitors to experience the garden with all their senses — walking barefoot, wandering through musical bamboos to create pleasing sounds and enjoying the fragrance of certain flowers. The Shapoorji Pallonji Native Biodiversity Garden Project was conceived in February 2015 and work commenced at the site in April of that year after procuring all permissions and identifying partners for its implementation. Nine months later, the green Eden was a reality! “We are happy that this Garden will serve as a learning center for visitors and school children who can come here to learn about biodiversity and native species. We also hope that this Garden boosts tourism for the beautiful Alibaug taluka,” is the wish of Aswad Patil, member of the Raigad Zilla Parishad which owns the land. The eight-foot-tall hand carved pillar of the deepmaal is illuminated with LED (light emitting diode) fixtures to integrate architectural heritage with modern technology. All Garden lights like the lotus cluster and red silk cotton shaped ones as well as the dragon fly embellished water pump are run on solar energy, while drip irrigation is used to water the plants, thus conserving water, a precious natural resource. A sacred grove represents the ancient culture of the Western Ghats where such areas have traditionally been used to preserve nature. To maintain all this requires much manpower. “Permanent full-time staff at the Garden include the garden supervisor (a trained horticulturist), three gardeners (two women and one man), two support staff/helpers to ensure visitor safety at all times and night security,” the partners state. “For specific interest groups, such as naturalists, environmentalists, wildlife photographers, etc, a professional botanist is available to take guided tours — however, this needs to be pre-booked. Pre-booking is encouraged, especially for school trips, in order to have adequate staff available to handle large groups,” they add. Lamenting that “urban biodiversity is fast disappearing and we need to create conducive habitats within our cities to protect and augment our native flora and fauna,” Pardiwala emphasizes that “biodiversity gardens give us an opportunity to regenerate valuable species” like the Eulophia orchid, the Krishnagaru and sandalwood trees. Native plants and seeds are available at a nursery on the premises to encourage the creation of more such gardens which in turn will boost wildlife and thereby enhance the biodiversity of the area. A colorful website (www.spbiodiversitygardens.com) provides a wealth of information as well as an interesting video encapsulating every aspect of the miniature Eden that this productive partnership has engendered. Entry to the Garden is free and it remains open on all days from 9 a.m. to 1 p.m. and 2 p.m. to 4.30 p.m. Situated near Teenvira Dam, approximately 14 km from Alibaug town, near Poynad, the Shapoorji Pallonji Native Biodiversity Garden can be reached either by road or by catching a ferry from Gateway of India to Mandwa and by road thereafter.